I hesitate to even type that title as who knows the new visitors I might get. 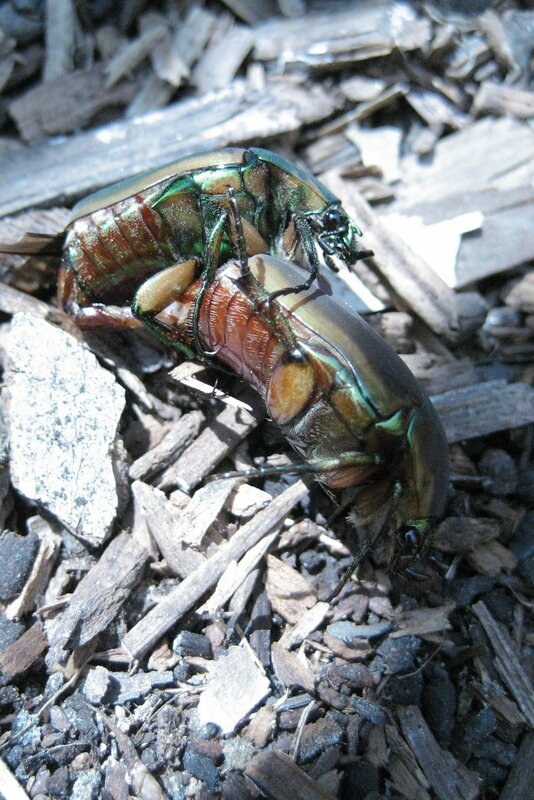 At least they look their best for the occasion in their iridescent colors. >The heat and drought really killed my desire to be out in the garden, but I feel some revival of my gardening passion with the small rains we have had in the past week and the knowledge that summer is coming to an end. Perusing my Texas Gardener for September, I can see I have my work cut out for me. -Go veggies. Time to plant for the fall. September in Central Texas means planting Snap Bush Beans, Broccoli, Cabbage, Brussel Sprouts, Cauliflower, Cucumbers, Kohlrabi, Potatoes and summer squash. My tomatoes that I cut back by half in August are going gangbusters in growth and will hopefully set fruit as temps at night cool down. And I’ll be adding compost before planting and mulch after planting. -Haircuts for everyone-I’ll cut back any summer bloomers that are looking tired or leggy to encourage a new bloom cycle. -Spray my St. Augustine to prevent brown patch that might occur with the cooler temps. I had this the past few years until I fired my lawn man and began treating it on my own. I went organic. -Make a list of plants I want to move. I’ll wait to do the dividing or transplanting until slightly cooler temps in late month or early October. Geez, I had better clear my schedule to make room for my gardening. Did you know there is a type of mold nicknamed “Dog Vomit Fungus”? 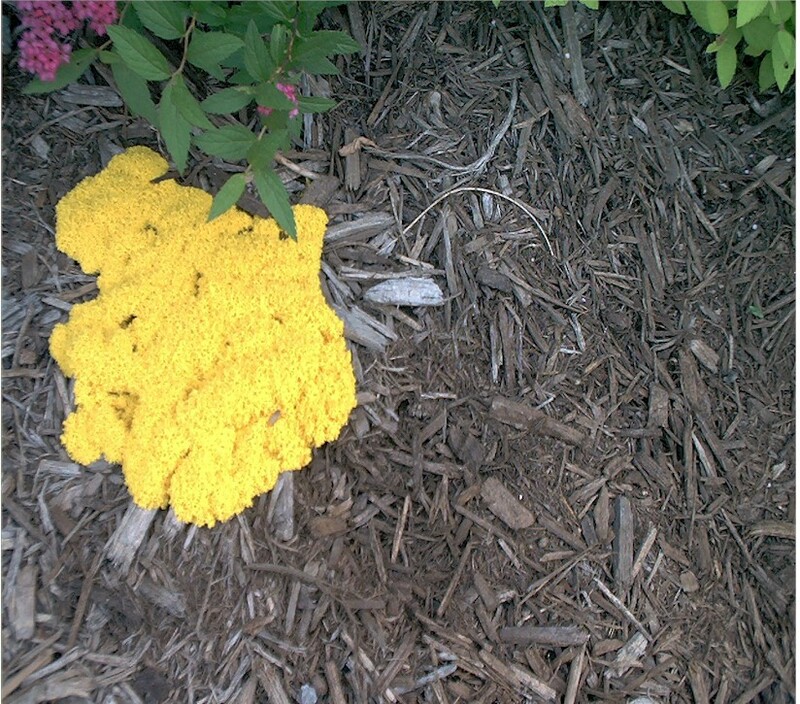 It’s actually not a fungus but a slime mold. And yes, they look like dog vomit, usually bright orange or yellow. Fungus Slippery when they’re now but they harden up and get paler. Kind of marshmellowy in appearance. I had some of these in my beds last year when it was so consistently wet from the rains. No surprise that none of them appeared this year with the drought. But I fielded a quiestion at the Master Gardener desk this morning on them. And when we’re all showing beautiful pictures of flowers, sometimes it’s good to throw in a little dog vomit. >Just in case you thought caring about honeybees wasn’t cool, check out this video. >So yes, I missed Bloom Day. But even if I had remembered , I would have boycotted because everything was so, well, crispy. I mean, it was just ridiculous. And there is only so much hand watering I have time or patience for. And then we had rain. And everything seemed to come alive again. And some newbies popped up that I had forgotten that I had planted.So thank you rain. And thank you flowers, for being so darn tough and waiting things out. Red Spider Lily. This one is a passalong from my dad, who got it as a passalong from my aunt, who got it as a passalong from someone in South Louisiana. These are also called Hurricane Lilies or Surprise Lilies because they pop up after the first good rain in late summer/fall during hurricane season. Bare stems emerge with a triploid bloom. Those bloom for a bout a week. In winter, foliage will emerge without blooms. I love the reds and yellows. And I have just been missing them this summer with all of the drought we have had. I don’t blame them. Who wants to bloom in such a furnace? 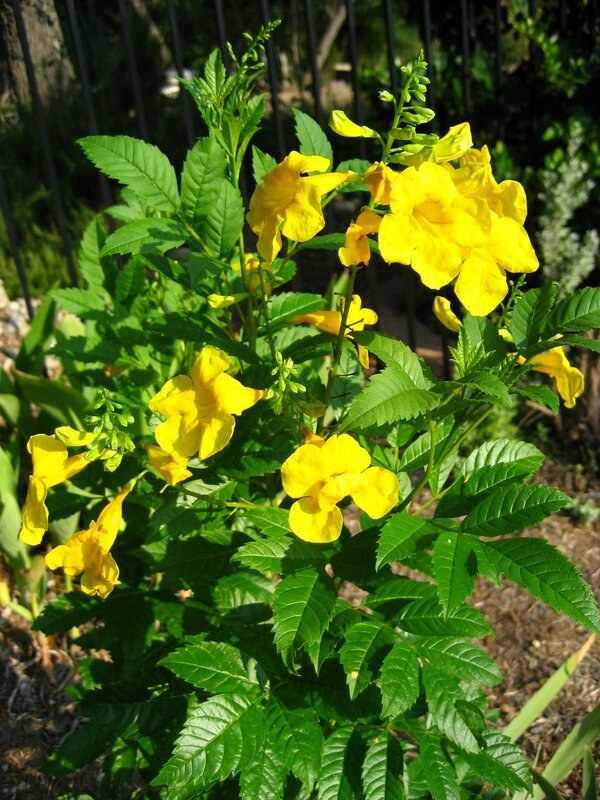 Esperenza (Tecoma Stans), or Yellow Bells finally blooms for me. 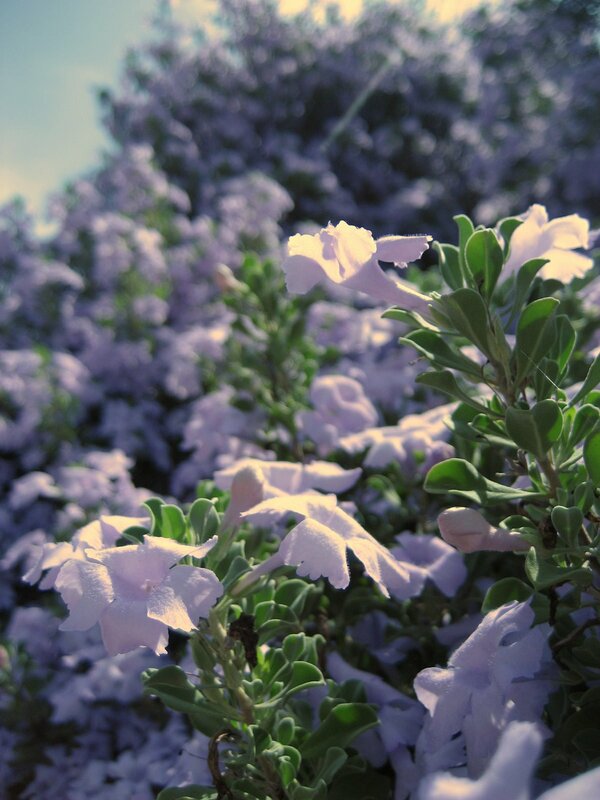 These can grow up to 8′ tall and are supposed to bloom spring through fall. But this is the first show I have had. But it’s also the first year I have had it, so it may be just getting established. Very heat tolerant. I have not seen one day of wilting this summer. 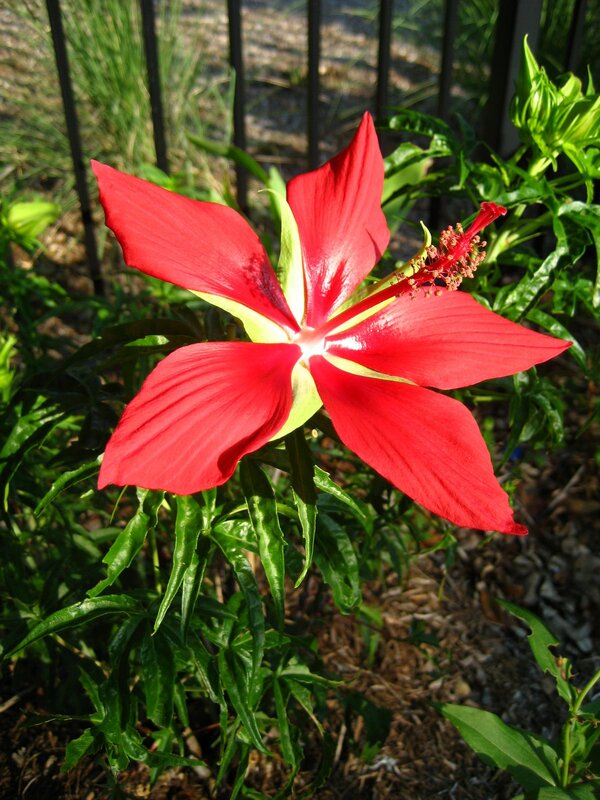 Texas Star Hibiscus. Moved from a pot to the ground this year and much happier. Gorgeous huge blooms about 3-4″ across. Heat tolerant. Nice to see the hibiscus blooming. It has quite a few buds on it, but I always seem to miss the new blooms, and I caught this one on a great day. My white garlic. I call it that but I’m not sure what specific type of allium it is. 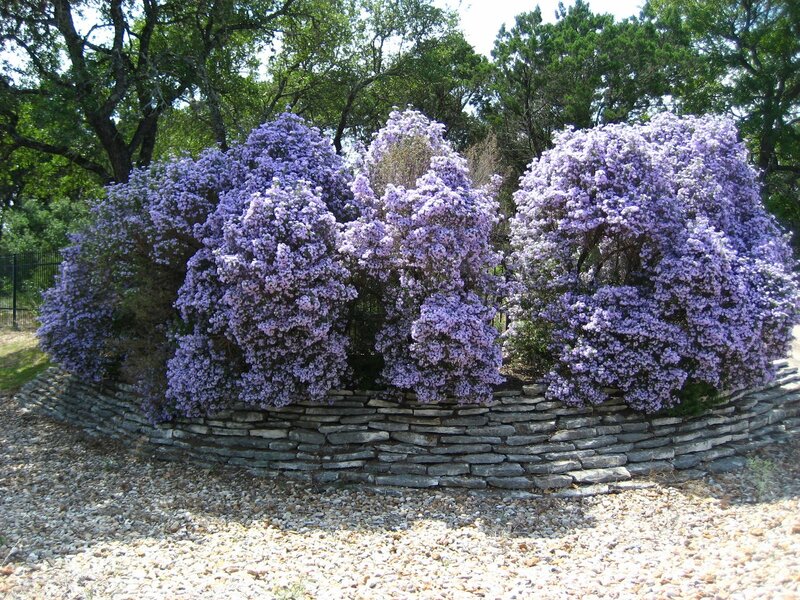 But it is gorgeous in blooms, spreads quickly, never has any diseases or pests, not surprising given it’s fragrance, and never wilts. Now, if only we could get some more rain. But nothing showing in the forecast for this week. >A slow rain has been steadily falling all morning. No drenching downpour but just drizzles, and then maybe a bit heavier for a while. The beds are soaking up every luscious drop that they can lap up. Because they have been dry, dry, dry. All last week- over 100 every day. Then the weekend came and we had overcast weather. “Mommy, it’s not sunny outside.” my four year old would say. Like he didn’t know what it was but it sure wasn’t the blazing sun he has seen every other day. We had to talk about cloudy. Then Sunday it started raining. Another discussion with my four year old. We walked out in the rain. “Ahhhhhh, I am getting drops on me. They are hitting me on my back!” he screamed. I told him it was OK and to just let the drops hit his skin. Feel the rain, I encouraged him. “Mommy, they’re getting on me!” Obviously, this was not going to be the dancing-in-the-rain scenario that I had envisioned. But today, everyone is back in school or at work and I did a nice yoga practice to open up my body and mind and came home to the gentle sounds of rain hitting my roof. I love that sound. And I hope I hear a lot more of it.